"Using The Infrastructure To Troubleshoot The Infrastructure" -- a wonderful expression we first heard proposed several years ago by our favorite Wi-Fi guru. That is, in a field dominated by expensive RF diagnostic tools like RF spectrum analyzers, doesn't it make sense to use a Wi-Fi device with an 802.11 chipset to troubleshoot a Wi-Fi network (populated by other Wi-Fi devices using 802.11 chipsets)? Who better than a Wi-Fi device to diagnose and monitor a wireless network -- especially one that costs a fraction of the more traditional tools that are currently used. WifiMETRIX is the first tool of its kind to employ a dual-band, 802.11 chipset strictly for the purpose of performing Wi-Fi diagnostics. Whereas the results from an RF spectrum analyzer requires the user to interpret a spectrum trace and make a guess as to the health of each channel, the results from WifiMETRIX closely mirror those of your wireless network. Hence -- no more guesswork. With WifiMETRIX, its 802.11 chipset tells you how other 802.11 chipsets likely view your RF environment. When installing a Wi-Fi network or troubleshooting one that performs poorly it is important to select a channel that is not subject to congestion or RF interference from other wireless devices. With wireless systems it is difficult to predict the propagation of radio waves and to detect the presence of interfering signals without the use of test equipment. Typically an RF spectrum analyzer is the preferred tool for detecting sources of interference and for providing information that allows optimal configuration of a Wi-Fi network. There are also other commercial tools designed to measure RF interference. In general, their short-comings fall under two categories -- either they do not employ an 802.11 chip for measuring the effect of RF interference or they require a complex setup that includes multiple devices -- e.g. one or more access points (AP) and wireless stations (STAB) -- which are specially programmed to implement a suite of test applications. IMMI is a patented technology that employs an 802.11 chip to compute the best Wi-Fi channel. When implemented in a device like WifiMETRIX it holds greater promise than other diagnostic tools for solving Wi-Fi problems related to congestion and RF interference. This is because it uses protocols inherent in all 802.11 devices to perform the diagnostics. That is, IMMI uses 802.11 hardware to monitor the RF environment through the same eyes as the Wi-Fi devices in your network. As an example, consider the hypothetical 2.4 GHz spectrum trace above with several moderate-size peaks of interference in the area of channel 1, a low, broad peak of interference in the area of channel 6, and a tall, narrow peak of interference in the area of channel 11. Which is the best channel -- 1, 6, or 11? And if one is better, then by how much? Using RF spectrum analysis alone, all we can do is guess. In wireless systems such as Wi-Fi the member devices communicate by transmitting and receiving packet data, and throughput performance is measured by the number of transmitted packets. In order to avoid collisions -- that is, multiple devices transmitting at the same time and corrupting their wireless packets -- a sensing protocol is used. Before transmitting, a device senses the RF environment and will transmit its packet data only when the channel is idle -- i.e. when the "coast is clear". If the channel is not clear, then the transmitter will delay a random period of time before trying again. Throughput performance suffers the more often a channel has to delay before being able to transmit its packet data. IMMI is simple and works like this -- it traverses each channel, measures the available transmit time and compares it with a calibrated reference value. (The calibrated reference is determined in a clean environment without congestion or RF interference). The resulting metric is "% Available Transmit Time". 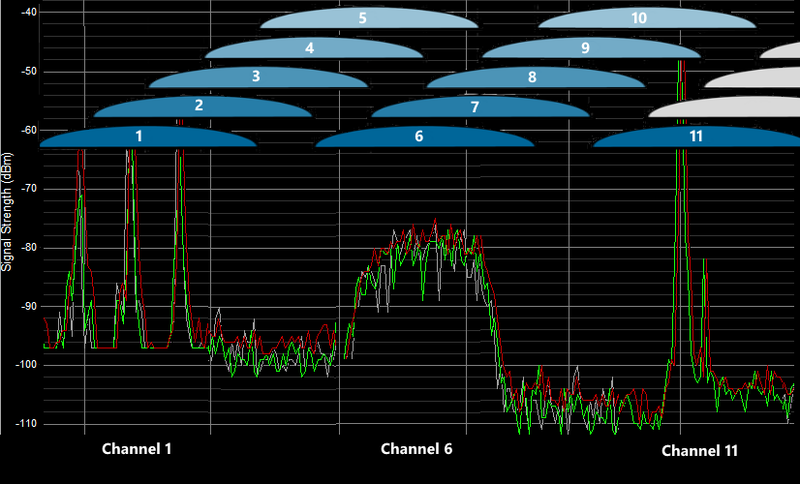 The channel with the highest "% Available Transmit Time" is the best channel. Since throughput performance depends on the number of transmitted packets, and since the number of transmitted packets depends on how much time is available and whether or not there are delays, then "% Available Transmit Time" truly reflects the health of each channel and can be used to rank channels from best to worst.